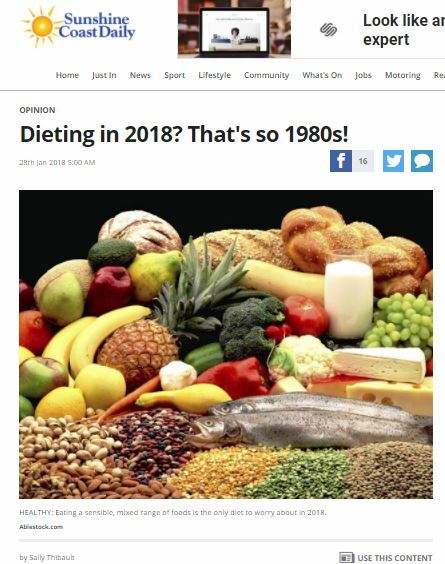 Dieting in 2018? That’s so 1980s! Which diet is the right one for you? When experts keep changing their minds, there is only one solution! One thing that I notice that is happening to me as I get older – is that I am more opinionated – and especially when it comes to fitness, health and personal development. I guess if you have been around as long as I have, you can sense when things no longer make sense. PALEO, ketosis, vegan, gluten free, clean eating, Isagenix, Juice Plus, Herbalife. You name it, there’s a fab, new wonder-way of eating at almost every turn as we head in 2018. How do you know which diet will work for you? What schedule of eating will lead to real, lasting results for your health and fitness this year? Each new year we’re presented with the latest list of fad food recommendations but many of these diets can honestly lead us astray and into more harmful health habits than when we first started out with good intentions. As a life, health and fitness coach, in my view there really is only one diet we should be following in 2018. And if you’re like me, you’ll agree that the constant barrage of “new” information, especially in the areas of health, food and wellness, is utterly confusing. In all my years of coaching, I have seen so many diets touted as the “new and improved” way of eating – only for that way to be discredited a decade later. In the 1970s the Pritikin Diet was popular. It was an extreme low-fat diet that was supposed to reduce weight and cholesterol. In the 1980s it was the Aitkins Diet – high fat, high protein, and not unlike the focus of the Ketosis protocol today. In the 1990s we were all about low fat – everything. In fact, it was believed that fat created fat, and so began the roll-out of low-fat products being sold everywhere. In the early 2000s the focus switched back to reducing sugar – where to make anything that was “low fat” taste good, you had to increase the sugar content. Now, there’s no end to the list of diets we can trial-and-error our way through for 2018. But in the more than four decades that I have been involved in the health and fitness industry, I have only really ever seen one diet – two rules – that truly work for many people. This is the way I believe Australians should be living as we head into 2018, to see real health results. One, follow the “healthy eating pyramid”, which encourages Australians to enjoy a variety of foods from every food group, every day. Eat mostly vegetables, fruit, proteins, legumes, nuts and drink lots of water – and limit salt and added sugar. Two, eat to satisfy a physiological need, not an emotional need. This year, let’s not latch on to the latest fad diet to see quick results and potentially end up harming our own health. Let’s get back to basis, eat as the health experts recommend and encourage each other to stay patient to see long-term results as we do the right thing. We don’t need more new recommendations – we need to simply follow the right advice that has been shared with us for decades. Together, in our online and offline communities, we can help each other have our healthiest year yet in 2018.